The new M2 range-topper may not be more powerful, but it should be a lot lighter. When rumors first started that BMW was cooking up a hotter version of the M2, several possible names were being thrown around. At one point, reports claimed BMW was planning to bring back the legendary CSL moniker for the next M2 variant. 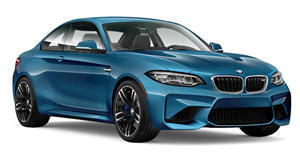 Of course, we now know BMW decided to name it the M2 Competition, which was packing an inline six-cylinder engine with 405 horsepower on tap. Don’t think this means the M2 CSL is dead, though. has outlined a roadmap of all future M cars BMW plans to unleash between now and 2021. Apparently, the range-topping BMW M2 CSL will launch in 2021 with a detuned version of the S55 turbocharged 3.0-liter straight-six gasoline engine from the M3 and M4 instead of the M2’s older N55 unit due to the increased reliability and improved responses the newer technology provides. In theory, this means the M2 CSL’s power output won’t be any more than 425 horsepower, which puts the car in a somewhat awkward position. If it’s using a detuned S55 engine, it may not be any more powerful than the M2 Competition. But BMW’s CSL range isn’t about raw power; it’s about saving weight. The clue is in the name, as CSL stands for ‘Coupe Sport Lightweight.’ As such, the M2 CSL should come equipped with a host of track-focused upgrades, including improved suspension and transmission parts, along with aerodynamic parts to make it as nimble as possible on a racetrack. To date, the iconic CSL moniker has only been applied to two production BMWs: the 3.0 CSL from the 1970s, and the . The latter was limited to less than 1,400 examples and was 242-pounds lighter than the standard M3 at the time. The M2 is regarded as one of the best M cars of all time and is often compared to the M3 CSL, so the prospect of an ultra-light M2 CSL is extremely exciting.